It is not often that we are invited into the privacy of another’s mind and heart. Most of us guard our deepest secrets with a fierceness that hides our deepest fears. Terry Wise, with unflinching honesty and courage, invites us into the far recesses of her heart and her memory giving us the rare privilege of witnessing the profound impact of speaking the truth. Illness, grief, loss, death, hopelessness and suicide are topics seldom raised for conversation, let alone one that pulls back the curtains to expose the raw emotions and tender vulnerabilities that are part of these very human experiences. In the unfolding of her story we catch a glimpse of ourselves, for her candor about her difficulties with trust, self-doubt, self-perceptions and despair gives voice to many of the questions that most of us, at one time or another, have or will encounter. She takes us into the intimacy of the relationship with her therapist as the two of them struggle to save her life. Terry’s memoir, Waking Up, is at once grippingly intense and reassuring for we know she survives. But it is precisely how she survives that draws us in, captures our attention and opens our hearts to the story she shares. 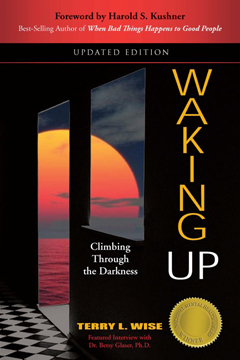 Reading Waking Up gives us the opportunity to bear witness to the healing capacities of the relationship between Terry and her therapist, one that offers much by way of example to those who practice and those students who are training to practice. One of the many gifts of this story is that Terry and her therapist allow us to see and experience the journey as it unfolds, walking along side both of them through the difficulties and challenges as well as the insights and transforming moments. While this book is an important contribution to professionals regardless of their level of expertise, it is an equally powerful contribution to deepening the common understanding of what it means to be human. Terry’s willingness to lay bare her life experiences in order that we might learn, that our suffering might be alleviated, that we might find hope or understanding is a tremendous offering, one that is received with deep gratitude. As a speaker Terry engages easily with her audience moving effortlessly between elements of her personal story and the application of hard earned wisdom from experience that inform the practical insights about grief and loss and tools for emotional health that she offers. She brings to her presentation an authenticity born of a willingness to ask the deeper questions and a compassion for those she speaks to that comes from suffering transformed. Her book Waking Up is required reading in the graduate course I teach.